Life doesn’t offer equal opportunities for everyone; through charity we can share our blessings with those less fortunate and thus try to bring balance in the society. The concept of charity derives from the fact to acknowledge that we own nothing but whatever has been given to us is a blessing by Allah (SWT) and it’s His property. So when we give out something from our pocket, we are actually sharing Allah’s blessings with His mankind and since we don’t own anything, we don’t lose anything by giving out but only gain Allah’s rewards. Charity is purely for the sake of Allah and no worldly gain should be intended while making charity. It should only be made to seek Allah’s forgiveness and His blessings. There are two forms of charity in Islam – obligatory and voluntary, called Zakat and Sadaqah respectively. Zakat means Purification, growth and blessing. It is given out once a year generally during the month of Ramadan. However, those failing to give Zakat in Ramadan, can pay their charities at any time of the year. It is one of the fundamental pillars of Islamwhich complete the faith of a Muslim. According to Islamic regulations, Zakat is 2.5% of one year’s total cumulative wealth. Zakat is compulsory for every Muslim and it is payable by every Sahib-e-Nisab. Calculation of Zakat is a very important matter and it should be handled carefully. Sadqah is voluntary act of charity. Sadqah doesn’t necessarily mean giving out wealth but it can be any simple act of Kindness that another human or even animal benefits from. It is a Sadqah in way of Allah to remove any difficulty from someone’s path as well as it is considered sadqah to smile at someone or just offering a simple Salam. Being kind to animals and taking care of their food is a charity. Offering water to a thirsty person or to help them with some burden are all considered charity and all these acts are rewarded by Allah (SWT). Both Zakat and Sadqah have been mentioned in the Holy Quran countless times. 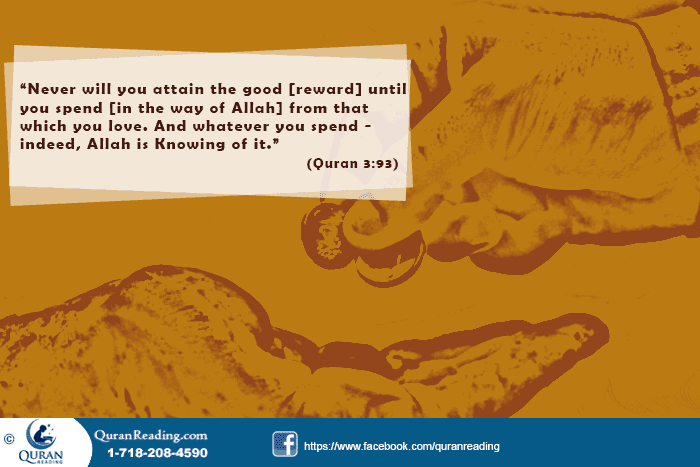 Paying Zakat is always mentioned next to offering Salah, which highlights the importance of Zakat in Islam. From multiple mentions of charity given in Quran and different examples in Sunnah, we can conclude that charity is essence of Islam and it has great importance in lives of Muslim. Muslim community thrives on charity. The effort Islam puts in financial check and balance for every member of the Muslim society shows the deep values for human rights. It helps building a strong society where the flow of wealth is even and basic human needs are met. Along with the help of those receiving charity, The Muslim who is Giving charity also benefits from it in terms of increase in faith. In Islam, charity is seen as multiplication of wealth in contrast to giving out money which keeps reminding Muslims about Akhirah and their accountability before Allah. Thus Islam and Quran heavily promote charity and every Muslim is rewarded with something which is way better than what he gives up in way of Allah.